Epson L1300 Driver Download. If you need to buy a printer A3 format. A compact 4-color A3 + printer for cost-conscious users, the L1300 is built around an ink tank system that offers high capacity up to 7,100 pages without recharging 1. With minimal intervention, the L1300 offers cost effective and hassle-free printing of advertising material, CAD drawings, graphs and reports, perfect for corporate office environments, retail and educación.Impresora L1300 Continuous Ink. An ink tank system integrated ultra-high capacity makes the perfect L1300 for heavy use where achieving the lowest cost per page is very important. Ideal for small offices that need to produce lengthy reports, advertising material or CAD drawings, the L1300 comes with five bottles of ink 70ml. Increases productivity system integrated ink tank L1300 makes for a maximum of 7,100 pages black and 5,700 pages for color-free recharging. When it's time for a change, no need to mess; with quick charging technology ink, clear labeling and a drip nozzle to refill the L1300 is a simple, fast and clean process. Reliable with specially designed ink tank results, no need to risk costly downtime or poor quality prints that can result from using ink tank systems of third parties. Fully integrated into the printer continuous ink supply ensures the L1300 monkey smoothly and color printing up to A3 +. This printer comes with a 12 months (30,000 pages) guarantee, providing peace of mind and help if needed. Fast business printing Within the L1300 is the Epson Micro Piezo technology and Epson Original Ink, which together offer quality print-outs. It benefits from print speeds up to 17 pages per minute (ppm) in color and 30 ppm in black 2, and print speeds of 5.5 ISO ppm color and 15 ppm in black. Value for money. Ultra-low cost per page. 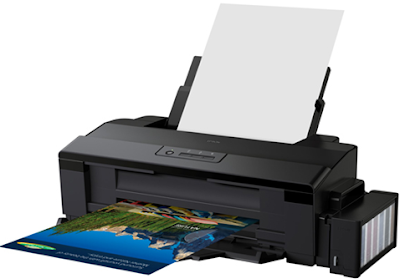 Print speeds up to 17 pages per minute (ppm) in color and 30 ppm in Black quality Epson. Built specifically, refillable ink reservoir. Print A3 +. First A3 + Epson 4 color printer SU. User friendly and No hassle with easy installation.